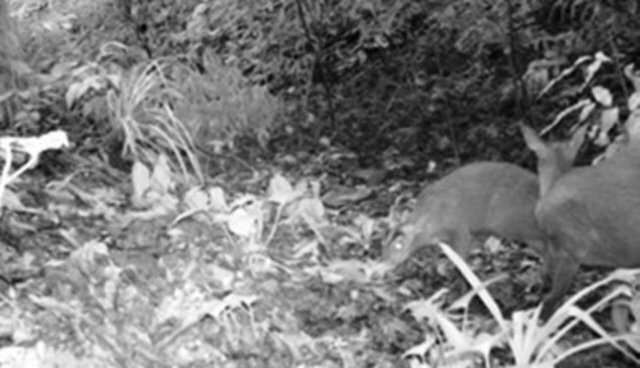 Once thought to have been driven to extinction in 1929, a deer species called the Roosevelt's Muntjac has been spotted in pictures taken by a camera trap at a nature reserve in Vietnam. While there have been rumors recently that the species still existed, this is the first evidence of the species for 85 years, according to Vietnam's Thanh Nien Daily. A pair of Roosevelt's Muntjacs, also known as Roosevelt's barking deer, was caught on a camera trap set up by scientists surveying barking deer populations at the Xuan Lien Nature Reserve in Thuong Xuan District, the reserve's management said Wednesday. It said the scientists also collected the animals' feces and got their DNA tested at the Institute of Ecology and Biological Resources in Hanoi, and found them to be a match for a DNA sample kept at the American Museum of Natural History. The Roosevelt's Muntjac, described by researchers at the Hanoi University of Science as "one of the most poorly known mammal species in the world," received its name when Theodore (Junior) and Kermit Roosevelt originally brought one back from a hunting trip in 1929, and presented to the Field Museum in Chicago.